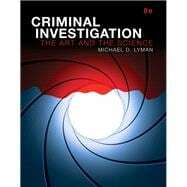 Written by a nationally-recognized expert in criminal investigation and police procedure, Criminal Investigation: The Art and the Science, 8/e, clearly and thoughtfully explains the fundamentals of criminal investigation and forensic science as practiced by police investigators across the nation. The text explores the past experience of investigators as well as new and emerging techniques in forensic science. Lyman focuses on the steps and considerations involved in actual criminal investigations and examines the many external variables than can influence an investigator’s success in the field. In the Eighth Edition, updated Case Studies, Learning Objectives, and graphics further illustrate the dynamic field of criminal investigation. Criminal Investigation: The Art and the Science, 8/e is also available via REVEL™, an interactive learning environment that enables students to read, practice, and study in one continuous experience. Learn more. Michael D. Lyman is Professor of Criminal Justice at Columbia College of Missouri, located in Columbia, MO. In addition to being a teaching faculty member, he serves as the program Coordinator for the Master of Science of Criminal Justice Program and the founder of the college’s Bachelor of Science in Forensic Science Program. Before entering the field of college teaching, he was employed as a criminal investigator for state police organizations in Kansas and Oklahoma and has taught literally thousands of law enforcement officers in the proper police techniques and methods of professional criminal investigation. Dr. Lyman has authored numerous textbooks in criminal justice dealing with the areas of criminal investigation, policing, organized crime, drug enforcement, and drug trafficking. He received both his bachelor’s and master’s degrees from Wichita State University and his Ph.D. from the University of Missouri–Columbia. He has been called upon on an estimated 300 occasions by law enforcement and the legal communities to review criminal investigations and render the results of his evaluations and his opinions in federal court proceedings nationwide. Textbooks are an ongoing work in progress, and the author welcomes communication and correspondence about his work. Dr. Lyman can be contacted at Columbia College, 1001 Rogers Street, Columbia, MO 65216 or at mlyman@cougarsccis.edu.